Keeping toxicity at bay in the diet has led me on a path of health and wholeness. This week’s meal plan is all about introducing fresh ingredients, such as nuts and seeds, fruits and leafy greens, good fats and oils, into your everyday dietary regimen. Eating more raw and detoxifying foods does not have to be an “all or nothing” approach, but rather, freshening up our diets with more whole ingredients and getting away from SAD (a.k.a. Standard American Diet) is the first step in a clean eating plan. Eating this way can be as easy or as difficult as one makes it; from gourmet Walnut-Kale Pesto with Zucchini Pasta to an almost-instant Berry Banana Smoothie to grabbing celery sticks and almond butter on-the-go, you may find the right recipes that work for you. Recipes include gluten free, dairy free and soy free options. After 10+ years on medication, Jennifer McClelland (aka Jennifer Mac) kicked the ol’ bottle, pill bottle, that is! 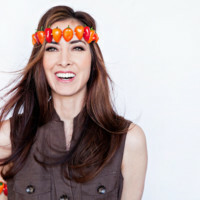 As a whole food and raw food chef, Jennifer Mac is passionate about sharing with others how to be deliciously healthy. With roots on a farm in Idaho, Jennifer Mac studied at Living Light Culinary Institute in Northern California and authored The Right Blend: Blender-only Raw Food Recipes and Detox Delish: Your Guide to Clean Eating. This week we celebrate fresh ingredients and highlight the extraordinary flavors from around the world, including American, Japanese, Italian, Middle Eastern, Greek, Mexican and Chinese cuisines. Each day also includes a deliciously healthy dessert option. By the way, these desserts are definite crowd pleasers and are perfect for potlucks and parties because eating healthy does not mean giving up deliciousness. In addition to running the watermelon and mint through a juice machine, you can also use the blender method by blending all ingredients together and straining the contents through a nut milk bag or cheesecloth if desired. Drink immediately. Serves 2. Blend all ingredients together until smooth, blending the ice cubes last. Drink immediately or store in the refrigerator for a day. Serves 1-2. Note: For green kale smoothies, I’ll tend to de-stem them and blend the leaves since the stems are a bit tough. The stems can be juiced. Soak the cashews for 2 hours then drain and rinse. Blend the cashews and water until smooth. Blend in the remaining ingredients then pour the mixture into a glass bowl or jar. This recipe can be served immediately or fermented. To ferment, cover the sour cream with a breathable towel and let sit 8-16 hours at room temperature and out of direct sunlight. Refrigerate in an airtight container up to 5 days. Makes about 2 cups. To make the salad: Cut the coconut meat (or zucchini) into thin slices then chop into ¾-inch length pieces. Place in a colander lined with a paper towel to soak up excess water. Use a paper towel to squeeze out excess juice from the celery as well. 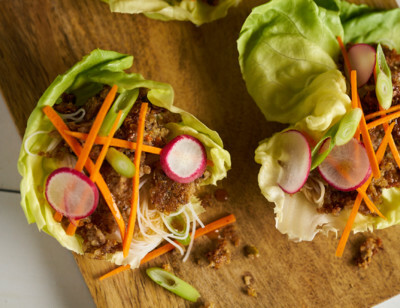 Fold in the remaining ingredients with the young coconut meat (or zucchini), pickles and celery. To assemble: Layer each Sandwich Round with a butter lettuce leaf and a couple scoops of salad and garnish with a dill sprig and pickle. Serves 4-6. *Young coconuts, often referred to as young Thai coconuts, have a tender flesh with a diamond-shaped crown, as opposed to the round coconuts often sold with a firmer, drier meat. An alternative to harvesting the coconut meat by hand is to buy it frozen and pre-cut into strips, often available in Asian or natural food stores. Blend the cashews and water until smooth. Add the remaining ingredients and blend again. Garnish each bowl of soup with a sprig of parsley. Serve immediately or refrigerate in an airtight container up to 2 days. Serves 4. To make the noodles: Slice the zucchini with a spiralizer or vegetable peeler. To make the cheeze sauce: Blend all the ingredients together until smooth. Scrape down the sides of the blender with a rubber spatula as needed. Combine the cheeze sauce until all the noodles are coated. For any leftover cheeze sauce, store in an airtight container up to 5 days and keep separate from the noodles. Serves 4. Using a mandolin, thinly slice the beet roots. In a bowl, mix the beets with the ingredients, except for the ground flaxseeds. Let marinate 4 hours or overnight in the refrigerator. Turn beets over so all areas get marinated. Transfer beets and mixture to a pan. Sprinkle the flaxseeds over the beets. Let sit 20-30 minutes so the flaxseeds soak up the marinated juices. Place beets in a single layer on dehydrator screen trays. Dehydrate at 115°F for 6 hours. Dehydrate for another 12 hours or until crispy. To assemble: Toss the noodles, cheeze sauce and top with beet bacon. *Red beet roots work well with this recipe, but I like Chioggia beets because their red and white rainbow scheme resembles that of bacon. Beet bacon is good and salty and pairs well with soups, salads and even in sandwiches. However, if you eat them alone as a chip, cut the salt amount in half to 1¼ teaspoons. In a blender or food processor, blend the cashews, maple syrup, cacao butter and coconut oil until smooth. Add in the cacao powder, salt and vanilla until combined. Scrape down the sides of the blender with a rubber spatula as needed. Pour the batter into a bowl then fold in the almond flour. Pour the mixture into an 8x8-inch pan lined with parchment paper. Top with walnuts and press them down part-way. Chill in the refrigerator 2 hours or in the freezer 30 minutes. Store in an airtight container in the refrigerator up to 2 weeks. Makes an 8x8-inch B-Raw-nie square. In addition to running the produce through a juice machine, you can also use the blender method by blending all ingredients together then straining through a nut milk bag or cheesecloth. Drink immediately. Serves 2. Soak the goji berries in 1 cup water (or coconut water) for 5 minutes to soften. Blend all ingredients together until smooth, blending the ice cubes last. Drink immediately or store in the refrigerator for a day. Serves 1-2. To marinate the mushrooms: Combine them with the marinating ingredients in a bowl. Let stand for at least 20 minutes. Remove the mushrooms from the bowl and gently squeeze out the juice. This leftover juice is the sesame-flavored soy sauce for the sushi. To make the sushi: Place a nori sheet, shiny side down, on a bamboo sushi mat. On the side closest to you, layer a horizontal row of sprouts, 2-inches wide and ½-inch away from the nori sheet’s edge. On top of the sprouts, layer narrow strips of the vegetables, including the mushrooms. Starting with the side closest to you, use your thumbs to flip the nori sheet over the contents. Keep the contents firm by using the bamboo mat to shape the roll, sliding it over and across the top of the sushi roll. Before the roll is complete, dab a little bit of warm water along the remaining nori edge to seal the roll. Use a serrated knife to slice the roll in half then slice the rolls in half 2 more times to make 8 sushi pieces. Serve immediately. Makes 10 rolls. Slice vegetables into ⅓-inch slices in any shape. Sprinkle with a pinch of salt and rest on a paper towel for 20 minutes to soak up excess juices. Then squeeze lemon juice and drizzle olive oil over the vegetables. To make the spread: Soak the cashews for 2 hours then drain and rinse. Blend the cashews and water until smooth. Add in the remaining ingredients. Miso spread can be stored in an airtight container in the refrigerator up to a week. To assemble the steaks: Add a dollop of miso spread and even it out over the top of each vegetable slice. Place each vegetable slice directly onto a dehydrator screen tray and warm for 4 hours at 115°F. As the veggie steaks warm up, excess liquid will come out. Before serving, place the veggie steaks onto a paper towel to soak up the excess juices. Store up to 5 days in a sealed container in the refrigerator. To serve: Place the steaks in the dehydrator 30 minutes to 1 hour before serving. Makes 16-22 slices. Oven option: On the lowest temperature, bake the veggie steaks for 20 minutes or until browned on top. Set aside diced mango for the topping. In a jar, combine all other ingredients and shake for about 10 seconds to loosen the chia seeds and psyllium husk. Before serving, set on the counter 20 minutes or chill 2 hours in the refrigerator or even overnight for a thicker consistency. To garnish, combine lemon juice with the diced mango and top each bowl with the mango and mint leaves. Enjoy this dessert chilled, at room temperature or warmed if desired. Store in the refrigerator in an airtight container up to 5 days. Serves 4. *Either white or black chia seeds work for this recipe; however, I use white chia seeds to get the desired green “matcha” color. In addition to running the produce through a juice machine, you can also use the blender method by blending all ingredients together and straining through a nut milk bag or cheesecloth. Drink immediately. Serves 2. Thinly slice the kale and massage with the lemon juice and salt until tenderized. Combine with the Romaine lettuce. 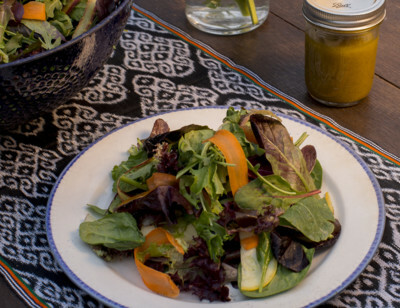 To make the dressing: Soak the cashews and raisins in the water for 20 minutes. Do not drain. Blend all the ingredients together until smooth. Store this dressing in an airtight container in the refrigerator up to 5 days. In a dry blender, grind the flaxseeds to form a flour consistency (if they are not already ground). Pulse the remaining ingredients in the blender a cup at a time until a crumbly texture is formed. Stop the blender to loosen the mixture with a rubber spatula as needed. Mix all ingredients together. Serve immediately or refrigerate in an airtight container up to 2 weeks. Makes 2 cups. 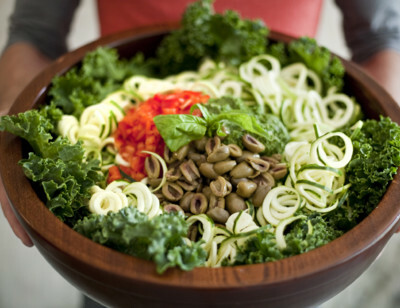 To assemble the salad: Pour dressing in with the greens until they are lightly coated and the desired taste is reached. Garnish with lemon slices and black pepper. Serve with the White Nutty Parmesan. Serves 4-6. Serving Suggestion: Add White Nutty Parmesan to pastas, salads or lasagna. *Macadamia nuts are often salted and harder to find in raw, unsalted form. If this is the case, go much lighter on the salt in the recipe. **Brown flaxseeds can be used, but to keep this parmesan a light color, I went with the golden-colored flaxseeds. To make the pesto: Combine all ingredients in a food processor and blend until smooth. Toss the pesto with the zucchini noodles, garnishing the dish with basil leaves and cherry tomatoes. Serve immediately or refrigerate in an airtight container for up to 2 days. Serves 4-6. Soak the almonds for 8 hours or overnight then drain and rinse. Blend the almonds with the remaining ingredients until smooth. Strain through a nut milk bag or cheesecloth. Use 1½ cups of the almond pulp for the Cake Layer and 1¼ cups of the almond cream for the Vanilla Mousse. To make the cake: First combine the flour, cacao powder, psyllium husk and salt in a bowl, working the ingredients through the fingers for a fluffy texture. Add the avocado while continuing to work the mixture, keeping it loose. Fold in the coconut palm nectar, coconut oil and espresso. Place contents into a 9x9-inch square or round springform pan lined with parchment paper and dust with a little cacao powder. Gently press the mixture into one layer: do not pack it. Place the pan in the refrigerator or freezer while making the Vanilla Mousse layer. To make the Vanilla Mousse: blend the coconut meat, Almond Cream, honey, soaked chia seeds and cashews until smooth. With the blender running on low, gradually blend in the coconut oil, lecithin, psyllium husk, vanilla and optional coffee extract until smooth. Scrape down the sides of the blender with a rubber spatula as needed. Pour the mousse layer into the pan. This is the second layer. To get the air pockets or bubbles out, let sit for 10 minutes then gently lift the pan ½-inch off the counter and drop a few times until most of the tiny bubbles pop. Chill in the refrigerator 6 hours or in the freezer 2 hours until firm. Before serving, dust cacao powder over the top. Makes one 9x9-inch Ti-Raw-misu. Stir together the Cashew Sour Cream, mint, garlic and salt. Slice the avocados in half. The avocado shells will be the “boats” to hold the contents. With a spoon, scoop out the avocado and cube. In a bowl, gently fold all the ingredients together and scoop into the avocado boats. Garnish with the Cashew Lebenah and parsley. Refrigerate in an airtight container for up to a day as the avocados brown easily. Makes 4 servings. Also spelled “Lebneh,” this is a Middle Eastern yogurt-cheese with Lebanese roots. To westerners, the taste is a cross between cream cheese and sour cream. It’s a wonderful addition to spread on bread or top on salads. Stir together Cashew Sour Cream, mint, garlic and salt. Slice the cucumber lengthwise then slice each half to make four long cucumber strips. Then slice the four long strips horizontally. Fold into the mixture. Garnish with mint and olive oil. Toss all ingredients then garnish with Lebenah and parsley. Refrigerate in an airtight container for up to a week. Serves 4. In a food processor with an “S” blade, combine the ingredients to form a crumbly texture. If using a blender, use the “pulse” button to combine the ingredients a cup at a time to form the mixture. Make sure the blender is perfectly dry. Stop the blender to loosen the mixture with a rubber spatula as needed. Pour the loose mixture into a 9-inch tart or springform pan lined with parchment paper. Spread the loose mixture out evenly with a higher layer around the rim to form a firm layer of crust. To make the filling: Slice the figs in half and soak them in water for 30 minutes or longer. Combine and blend all the ingredients in the food processor until smooth, scraping down the sides of the container with a rubber spatula as needed. Pour the filling onto the crust. Chill in the refrigerator for 4-6 hours or in the freezer 2 hours until firm. This dessert stores in an airtight container in the refrigerator up to 5 days or in the freezer for up to a month. Makes a 9-inch tart. Blend all the ingredients together until smooth, scraping down the sides of the blender with a rubber spatula as needed. Served at room temperature, this dessert topping is a sauce. If chilled in the refrigerator for 4 hours or longer, it becomes a whipped topping. Makes over 2 cups of topping. Leftover topping can be stored in an airtight container in the refrigerator for up to 5 days. *Sesame seeds normally only need an hour to soak, but for this recipe I soaked the sesame seeds and cashews in the same bowl for convenience. **Black or white sesame and chia seeds will work for this recipe, but I used white seeds to keep the creamy color consistent. Juice it! Drink up. Serves 1-2. Blend all ingredients together until smooth, pulsing in the ice cubes gradually. Drink immediately. Serves 2. Soak the cashews for 2 hours then drain and rinse. Blend the cashews and water until smooth. Blend in the lemon juice, miso and sea salt then pour the mixture into a glass bowl or jar. Leave the mixture to ferment 20-24 hours, folding over the contents with a rubber spatula once or twice in between. Transfer to a shallow bowl or plate then cover with a breathable towel, nut milk bag or colander and put in the refrigerator for 3-5 days to dry out, folding the contents with a rubber spatula once a day to help dry out the mixture. At this point, add a bit more salt, if you want, as traditional Greek cheese is quite salty. Take the mixture and mold it into an oval-shaped ball. Roll the ball in ½ cup flour (almond, coconut, etc.) then it wrap in a cheesecloth. Set the wrapped cheese ball back in the refrigerator as it will continue to cure and dry out for 3 days and up to 2 weeks. You can tell if it’s fully cured by holding it and noting its firmness. Once unwrapped from the cheesecloth, store the “cheese” in the refrigerator in an airtight container up to 2 weeks. Makes about 1 pound. To assemble salad: Toss all ingredients together and top with bite-sized Cashew Cheese pieces. Refrigerate in an airtight container up to 3 days. Soak the pumpkin seeds 4-6 hours then drain and rinse. Soak the cashews 2 hours then drain and rinse. In a food processor, add the ingredients, except for the nutritional yeast, and blend until smooth. Scrape down the sides with a rubber spatula as needed. Stir in the nutritional yeast. Transfer the mixture into a serving bowl. Garnish with the parsley and 1 tablespoon of olive oil until smooth. Serve immediately or refrigerate in an airtight container up to 3 days. Makes about 4 cups. 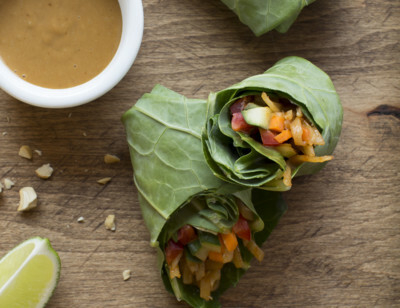 To prepare the wraps: Lay the leaves, shiny side down and remove the stems and veins. The vein can be reduced by running a knife over the vein to flatten it; the more of the vein you remove, the easier the leaf will roll. In a shallow pan, marinate the leaves in the liquid for at least an hour. To make the filling: In a dry blender pulse the flaxseeds into a flour consistency and set aside in a large bowl. Then pulse the macadamia nuts to a crumbly mixture and add to the same bowl. Combine all the ingredients. To assemble the Dolmas: place a leaf shiny side down. Add a spoonful or two of the filling, depending on the leaf’s size, at the base. Roll the base of the leaf over the mixture then fold in the sides before rolling the rest of the way. If the dolmas start to unfold, use a toothpick to hold them together and remove before serving. Another option is to wrap each dolma in plastic wrap and remove before serving. Makes 12-18 dolmas. To make the apple “filo”: Use a mandolin to slice the apples as thin as possible. Coat the apple slices with lemon juice to prevent browning. I also coat my hands in lemon juice when handling and assembling the apple slices. Five slices will be used per serving. To make the filling: Use a food processor to break up the walnuts to the size of grape seeds and set aside. Use a blender to combine the remaining ingredients until smooth. Reserve ½ cup of the sauce for the garnish. This topping stores in an airtight container in the refrigerator up to 2 weeks. To assemble into one big dessert: Layer an apple’s worth of slices on the bottom layer of an 8x8-inch pan then layer on 2-3 scoops of the filling. Repeat three more times then garnish with walnuts, more filling and dust with cinnamon. To assemble individual desserts: Start with a square apple slice then top it with a spoonful of filling. Repeat by stacking another 4 apple slices/filling combinations to make 1 serving. On the last apple slice, garnish with more filling, walnuts and cinnamon. Makes 8-10 individual Bakla-Raws or 1 8x8-inch pan. Juice it! Drink up. Serves 1-2. The enzyme bromelain in pineapple treats indigestion and constipation. The celery in this beverage adds a hint of savory. For a creamy Co-Raw-da, add ½ cup of your favorite milk, cream or yogurt. For the Guacamole: Mash all the ingredients with a fork until smooth. Serve immediately or refrigerate in an airtight container for up to 2 days. Makes about 2 cups. For the taco filling: In a dry blender, pulse the flaxseeds into a flour consistency and set aside in a large bowl. Pulse the walnuts a cup at a time until a crumbly texture is formed, stopping the blender to loosen the mixture with a rubber spatula as needed. Add the crumbled walnut mixture and the remaining ingredients to the bowl with the ground flaxseeds and mix well. For the taco shells: Fold the Romaine leaves in half so the stem is the base of the taco. If desired, cut each folded leaf to 4 inches in length. To assemble: Add about ½ cup of the ground filling to each lettuce shell. Garnish with a dollop of Sour Creamed Guacamole. Another option is to add the filling with a piping bag, squeeze bottle or plastic sealed bag with a small incision made at the bottom corner. Serve immediately or store contents individually for up to 3 days. Makes 6-8 tacos. With a food processor or by hand, thinly slice the cabbage and onion. Put the slices in a large glass bowl then add the salt to the vegetables. Toss the contents so the salt is spread out evenly. With clean hands, massage and squeeze the contents to release the juices. Add the remaining ingredients. Use a weight to fully submerge the vegetables in the glass bowl or stuff the contents in a glass jar, ensuring the liquid rises above the vegetables. A little water may need to be added. Cover with a breathable towel and let sit at room temperature and out of direct sunlight for at least 3 days and up to 2 weeks or even longer. Add a lid and refrigerate for 2 months. Fills a ½-gallon jar. Note: This appetizer can be eaten immediately after making, but it won’t have the fermented aspect without the wait time. To make the Cream: Soak the almonds for 8 hours or overnight then drain and rinse. Blend the almonds with the remaining ingredients until smooth. Strain through a nut milk bag or cheesecloth. Makes 2¾ cups. To make the flan: In a pan, dissolve the agar powder by whisking in ½ cup water. Keep whisking and bring to a boil for 1 minute. Cool then add, with the remaining ingredients, into a blender. Blend all ingredients together until smooth. Pour the flan into 6-8 ramekins or small bowls. Chill for 2 hours or until firm. Serves 6-8. To make the topping: Place ingredients in a bowl and stir contents together until smooth. To assemble: Add a small dollop of sauce to the top of each flan before serving. Refrigerate in an airtight container up to 5 days. Blend or stir the ingredients together. Use hot water if desired. Serves 2. Blend all ingredients together until smooth, pulsing in the frozen ingredients gradually. Drink immediately. Serves 2. Instant noodles literally mean “convenient noodles” in Chinese. 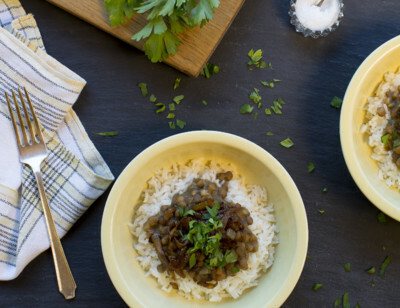 This veggie version offers beauty in a bowl. To make the noodles: Slice the zucchini with a vegetable peeler or a spiral slicer. Place the “noodles” in serving bowls. To make the broth: Blend the ingredients together until smooth. Cool, warm or hot water can be used for this recipe. To assemble: pour broth into each bowl of noodles. Top each bowl with the finely diced vegetables. Serves 4-6. This Chinese cold dish, meaning “smashed cucumbers,” is traditionally made with white vinegar. The crushed cucumbers soak up the flavors, so this dish is even better the next day. Slice the cucumbers lengthwise in half then cut into diagonal slices. With the side of your knife, smash the cucumbers. Combine all the ingredients together and serve. Refrigerate in an airtight container for up to 5 days. Serves 4-6 (meant to be eaten in small amounts). Zha Jiang Mian or Zha Jiang Noodles means “fried sauce noodles,” but this recipe is anything but fried. This fresh version has the same flavor without the fried oils and pork. To make the sauce: Soak the sunflower seeds 2-4 hours then rinse and drain. In a food processor combine the sunflower seeds and water. The texture does not have to be perfectly smooth. Add the mushrooms and blend again. Then add the remaining ingredients, stopping occasionally to scrape down the sides of the food processor. Zha Jiang Mian is traditionally served in separate bowls, dividing the noodles and toppings. The noodles and sauce can be served either warm or cold. For a warm dish, place in the dehydrator for 1-2 hours at 115°F or in the oven on the lowest temperature for 15-20 minutes. Serves 6-8. In a food processor, combine the ingredients, except the almond halves, until a crumbly texture is reached. (You can also use a blender by pulsing 1 cup of ingredients at a time to form a flour consistency. Then add the crumbled mixture to a bowl and combine with the sweetener, vanilla and salt until a doughy texture is formed.) Roll the dough into little balls and flatten, topping with an almond. Place the cookies directly onto the dehydrator tray and dehydrate at 115°F for 8 hours. If using an oven, set the temperature at the lowest setting and bake for 15-20 minutes. Makes 20-22 cookies. *The almonds do not have to be peeled, but to get a white-colored flour, they can be blanched by placing them in boiling water for 60 seconds. Drain and rinse with cold water and pop off the skins. Another method is to soak the almonds 36-48 hours, replacing the water every 12 hours. The skins can then be easily removed by peeling or popping them off. The soaked almonds will dry out in the food dehydrator.